paper askew studio: WOW Scary! BOO! Wow is this hair scary or what?! Cat requested a picture of my "big hair" days and while this isn't as big as it got, it still looks kinda big to me now. 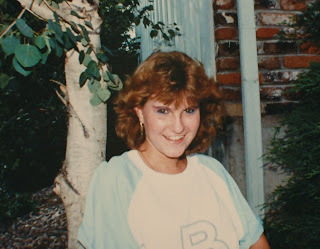 Yep this is me back in 1987, my summer before high school (when my hair got bigger). OH those were the days! Young and full of the "I know EVERYTHING" attitude. I think one of the best summers of my life. Up till 2 AM slept till noon, go swimming, have pizza with friends and do it all over again the next day. I used some Tangerine Tango (lovin' that new SU In Color) and basic black. It is hard to tell but I did use Certainly Celery craft ink on some of the framed stamped images which are from "What's In Your Tin 2" from Gina K. The little skeleton is from "Bitty Boos" which is a retired SU set. Love that little guy! hahaha! LOVE it! So Farrah Fawcett!! You really had gorgeous hair too, seriously! It might be stiff as all get out, but, it did look good...for the times, lol!! Thanks for sharing, loved it! And love that card! I have got to get some of that color..it is gorgeous! You are so brave sharing those pictures.....nothing scary about them tho!!! Love the skeletons on the card, they are so cute! OMG how cute are you! You look exactly the same now but with better hair! LOL thanks for the peek into your past hun! Love this card Tangerine Tango is such a fabulous colour!! LOL about the aquanet...too funny! Love the photos! and super cute card! Those photos are classic! 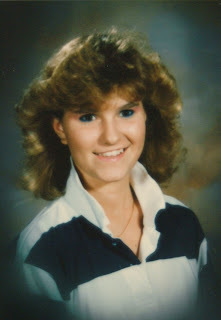 I wasn't part of that hair stage...but I did have the horrendous wave bangs for a long time. Yikes! 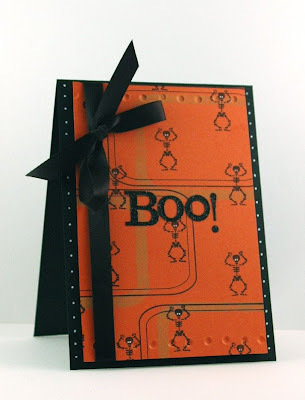 And that little Halloween card is utterly adorable! I just love the little skeletons! this is so cute, I was admiring the "paper" when I was here earlier I only just nbow noticed that's mny label!! HEE! high five! PAM!!! 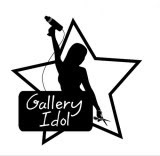 OMG, I love it!!!! You have the most beautiful smile!!! I just posted my high school pictures on a stamping forum I belong to last week! How funny! Poison, Cinderella, Bon Jovi, Rat, Skid Row, Winger...ahhhh, the memories! In 1987, I was in the 7th grade and went to my FIRST Bon Jovi concert and got to meet them! They signed my cast! Forgot and when it was removed I told the Dr. to pitch it. GRRRRR!